Lauren Bowen with the state treasurer’s office speaks to Greenfield Village Council on Tuesday. The Ohio State Treasurer’s Office wants to help Greenfield residents see how the village spends tax money by helping digitize expenditure documents and make it all available online. 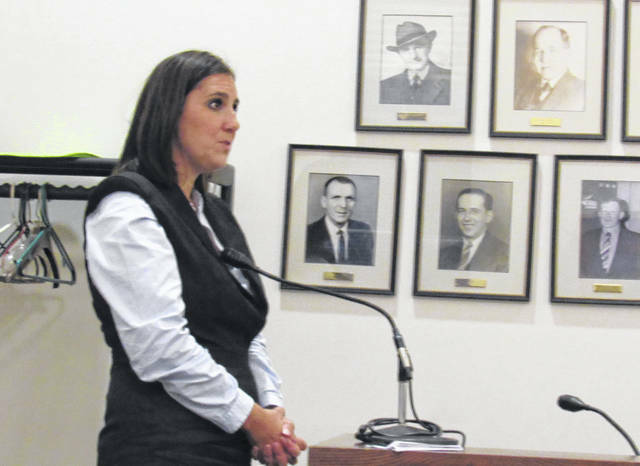 Lauren Bowen, a representative of the treasurer’s office, spoke to Greenfield Village Council about the topic at Tuesday’s meeting. She said going digital is something other Highland County communities like Hillsboro, Leesburg and Lynchburg have already done. Bowen said representatives from her office have been traveling all over the state, to all 3,962 local governments, to help make their expenditures more accessible to the taxpayers. All it would take for Greenfield is a enough time to “pull the data,” Bowen said, and a public web address can be generated so anyone can see how tax dollars are spent. Bowen said the project is completely free and she would be on hand to facilitate the whole process. It is an endeavor that Bowen said the state office is passionate about. “I like it,” Councilman Chris Borreson said, adding that the public should know how their tax dollars are being spent. “It is our heartfelt belief that it is (the taxpayer’s) right to know,” Bowen said. How the village will proceed is yet to be determined, but the matter will be discussed further in a Finance Committee meeting scheduled for next week, Councilman Eric Borsini said. To see how Ohio is spending your tax dollars, go to www.ohiocheckbook.com. In other business, City Manager Todd Wilkin said he spent the two hours prior to Tuesday’s meeting addressing water bills with local landlords. He said he heard many times how common it is for tenants to run up water bills then move before paying them, leaving the landlord stuck with the bill. Wilkin said Greenfield’s current ordinance on the matter, passed in 1964, states that the homeowner or lessee (tenant) is responsible, but how Greenfield handles it is through the homeowner only. The legislation also holds that the homeowner is ultimately the responsible party when it comes to unpaid water bills. Wilkin said the ordinance as it was written indicates some accountability should be placed on the tenant as well. He suggested later that the ordinance perhaps didn’t need to be changed, but the village could change how the ordinance is implemented, like by adding the tenant’s name. The city manager said something else that could help, beyond ordinance review and revision, is water billing software that the village is working on implementing. Residents will be able to use the software to pay online, review water usage and payment history, and get email notifications. Also, a landlord will be able to see the same information about a property as the tenants. Additionally, another computer system the village is working on reads meters via radio two times daily. This will help get a handle on water usage at a property and help spot leaks well before they are able to be spotted now. The latter system is currently in the stages of being priced specifically for Greenfield’s needs. In other matters, Wilkin said a village cleanup day is scheduled for Saturday, Sept. 22 from 9 a.m. to noon. Residents can bring refuse to Rumpke’s dumpster site by the railroad tracks on South Washington Street during those hours. The following week, on Sept. 28 and 29, the village’s yard waste site will be open from noon to 4 p.m. and from 8 a.m. to noon, respectively. It is at Greenfield’s wastewater treatment plant, located at 187 Lost Bridge Rd. Both events are free to residents. Wilkin also congratulated council Clerk Roberta Karnes, who recently celebrated being with the village for 39 years. He also congratulated Weller’s Plumbing, which is celebrating 75 years in business this month. The milestone is a “tremendous feat,” Wilkin said. Greenfield Village Council meets in regular session the first and third Tuesday of each month at 7:30 p.m. in the council chambers on the first floor of the City Building. The meetings are open to the public.